The Federal Deficit Is Actually Shrinking : It's All Politics The Congressional Budget Office projects the deficit will drop below 4 percent of GDP next year and below 2.5 percent in 2015. Still, despite the improvement in the short run, the federal government faces long-term deficits, mostly tied to health care costs. The Treasury Department announced this week it will pay down some of its debt for the first time in six years. During the housing bust, taxpayers were forced to bail out mortgage giants Fannie Mae and Freddie Mac. But thanks to the real estate recovery, Fannie Mae could end up paying tens of billions of dollars back to the Treasury this summer. That's just one of the factors behind a better bottom line for the federal government. This week, the Treasury Department announced it will pay down some of its debt for the first time in six years. 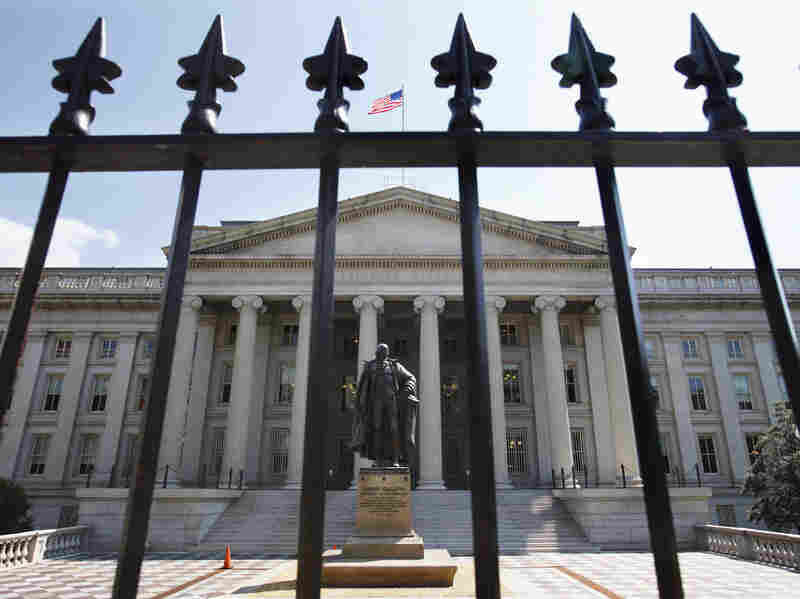 Washington has been so preoccupied with warnings of exploding deficits in recent years that John Makin of the conservative American Enterprise Institute was caught off guard when he checked out the numbers. "I'm surprised that more people who talk a lot about it haven't looked carefully at where we find ourselves," he says. The federal deficit is shrinking rather quickly — both in absolute dollars and as a share of the overall economy. The Congressional Budget Office projects the deficit will drop below 4 percent of GDP next year and below 2.5 percent in 2015. Greg Valliere of Potomac Research says the improvement could come even faster, thanks to rising government tax receipts and shrinking government payouts. "There are two really big spending stories that are changing the fiscal outlook in Washington," he says. "The first is that there's no new spending. Anything the president proposes will get rejected by the House. Secondly, through sequester and other cuts, domestic discretionary spending is actually falling." In a way, policymakers backed into this shrinking deficit. Both the spending cuts and the tax increases are more the product of government stalemate than any deliberate action. The economy is paying a price in slower growth. Even some conservatives like Makin are now warning that austerity has gone far enough. "Deficit reduction means slowing the growth of spending and raising taxes. And nobody likes that. So you have to be telling the story of ... we're doing some short-run pain for long-run gain, but we're not doing too much of it," he says. "And that's why I think we've done enough austerity for now." Liberal economists argue that government has gone too far in its belt-tightening. Jared Bernstein of the Center on Budget and Policy Priorities hopes the rapidly improving budget picture will help to silence deficit alarmists. "If that diminishes the urgency to recklessly cut spending in the short term, that's actually a good thing," Bernstein says. "Because we've actually overcut in the near term and that's hurting the weak economy and people who depend on some of these benefits." Bernstein notes that government spending on unemployment, for example, fell by 25 percent in the first quarter from a year ago. That's good news for those who went off the rolls because they found jobs. But not for those whose benefits simply ran out or were cut back indiscriminately. "There are millions of people across the country who are seeing their unemployment benefits reduced because of sequestration," he says. "They don't have a job. In fact, they're still legitimately on unemployment insurance. But the sequestration is taking a chunk out of their benefit check at a very bad time for them." That's also less money circulating in the economy. One byproduct of the falling deficit is that the government won't bump up against the debt ceiling so quickly. Steve Bell of the Bipartisan Policy Center says forecasters initially thought Congress would have to raise the debt ceiling this summer. Now that's been pushed back a bit. "I think we will be able to see them get into fall before we have the confrontation between the Congress and the president over the debt ceiling," Bell says. What's not clear is whether fall's cooler temperatures will lead to cooler heads at the bargaining table. Despite the improvement in the short run, the federal government still faces long-term deficits, mostly tied to health care costs. AEI's Makin says policymakers now have more time to address that challenge. But that could be a blessing or a curse. "The fact that Congress is not operating under the gun, the White House is not operating under the gun here, gives them some time to sit down and be thoughtful about restructuring entitlements and [the] tax system," he says. "I think many people fear that if you take the pressure off, Congress moves on to other things." That lack of long-term thinking is a different kind of deficit that Washington has yet to overcome.